Hi, my name is Ruthie and I am so excited to own Dog Gone Running! It allows me to combine my two passions: love for dogs and running. Crazy as it sounds, running has always been an outlet and source of joy for me. An interesting fact is that I have completed 9 marathons including Boston Marathon and The Moscow Peace Marathon. My other job is as a Fitness Instructor teaching Spin, TRX, and Bootcamps. 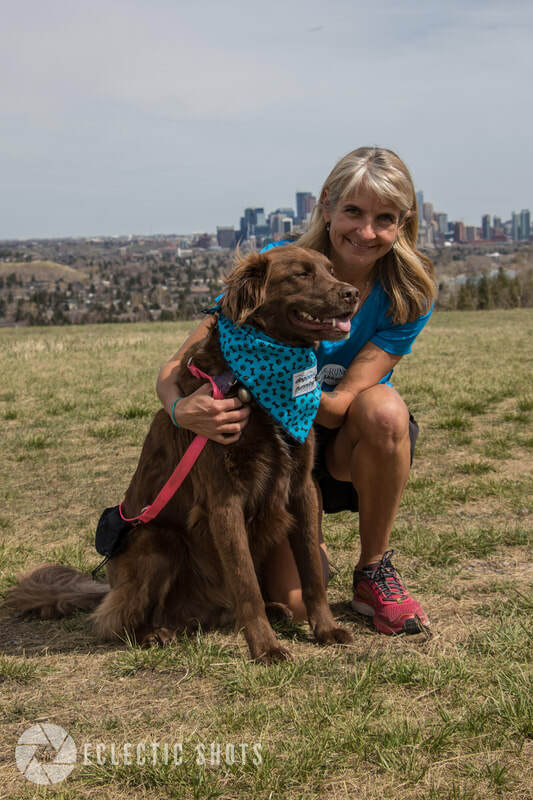 I am dedicated to improving the lives of dogs and have fostered 11 rescue dogs, processed adoption applications, and been a Shift Leader at the Alberta Animal Rescue Crew Society (AARCS). I kept one of my foster dogs (a chocolate Shepherd/Lab X) named Teddy who loves to chase tennis balls and run. Dog +Running = True Joy. Hi, my name is Alison! I am new to Dog Gone Running. I grew up in Vernon BC and moved to Calgary in 2018 for nursing school. I love dogs and I love running so I thoroughly enjoy myself when I get out with the doggies for fresh air and a good run. I have a busy schedule so running dogs a couple times per week is a perfect for me! I have completed a few half marathons and other races, including Tough Mudder. I love to challenge myself with new activities all the time and stay active. I think Calgary has the best variety of dog parks and running trails and I love exploring them with my Dog Gone Running dogs! I grew up in NW Ontario, always loving the outdoors and four-legged creatures. Between my house and my grandparents, we always had pets... dogs, cats, fish and even turtles. I moved to Calgary in 2004 to work for West Jet Airlines; a company I love and adore, but traveling does not allow me to have a pet of my own. In 2009, I started to get involved in the running world, by doing half-marathons, which increased to full marathons and now trail running. Being active outdoors is my favourite hobby. Taking a loving pet along for the adventure just adds to the day. Hi, my name is Fab and I grew up in the south of France where I loved running those Pyrenees mountains since a very young age. I always loved dogs and was a Belgian Sheepdogs Breeder in my country. I always loved running but never really took it seriously until 2016. Now, that I realized that I can “run all day”, I enjoy running ultra distances (100km and 100milers) races. Being a part of the Dog Gone Running team is an amazing opportunity for me to combine my three loves: running, dogs and taking hilarious pictures of your pets!! I've always had a soft spot for very energetic dogs - and running has been an on and off again "passion" in my life. Running for DGR has been a fantastic way to combine both. Life is pretty busy with two boys and a "day job" as a physician - but there's nothing like running with an enthusiastic canine partner to recharge the soul and keep me fit enough to keep up with my family on the trails and the slopes! Hi! My name is Brooke from Brooks, Alberta (my parents have an odd sense of humour). I was born and raised on a cattle ranch, show jumping horses competitively, and surrounded by all sorts of other animals; including Border Collies - great cow-working dogs, and loving companions. I’ve always loved dogs, but haven’t been able to have my own now that I live in Calgary. Being a Flight Attendant for WestJet doesn’t keep me on the ground for long! So I was thrilled to join the Dog Gone Running family; allowing me to hang around awesome dogs and get some wicked exercise in the meantime! Born and raised in Calgary, I have devoted much of my life to academics and athletics. Beginning my sporting career at the early age of 4, I focused primarily on Soccer and Basketball as activities of choice. Growing up, I also spent a lot of time volunteering at the Calgary Humane Society as well as spent time during the summer at a family member's pet grooming service in California. I am currently enrolled at Mount Royal University in a Bachelor of Health Science and Physical Education, I hope to continue my post-secondary career in Medicine. Currently I work as a Medical Receptionist, Server and Tutor. Outside of work and education, I enjoy playing on a Women’s Soccer team here in Calgary as well as volunteering with organizations for disabled children. At home, I devote most of my time to my studies, my cat, Mango, and friends and family. I started running about 10 years ago and would see other people running with their furry friends beside them and I wanted to do the same. I live in a condo so didn’t think it was fair to have a mid to large size dog (which is what I wanted) in a small space. I have always had both dogs and cats growing up but I feel condo living is more suited to cats which I have 2. I had offered to take friends dogs with me on my runs in the past and when I saw an ad for Dog Gone Running, I thought it was perfect for my situation. I love being outdoors and there is nothing better than a relaxing run with a four- legged buddy by my side. My name is Ryan Everett. I am fresh out of high school, almost an adult and in need of cash. I've caught myself thinking: "What better way of making a fortune than running dogs for money?" Seriously, I love dogs and am adjusting to running. My main passion is Breakdancing so if you see me bust a move running your dog, you will understand why. Hi, my name is Kathy. I have been active all of my life, my main sport being soccer. I played 5 years of varsity soccer at the University of Lethbridge and I continue to play at a competitive level locally. I have always been a dog lover, but a busy schedule has always prevented me from owning one so running with these pups is a great compromise! I'm looking forward to spending time with the dogs while getting in some fitness at the same time. Hi! My name is Nancy. I was born and raised in beautiful BC, but have called Calgary home for the past 12 years. I have always been an avid runner…..even as a child, I rarely walked anywhere; I always ran. Dogs have been a constant in my life as well. I am currently a stay-at-home-Mom and an elite obstacle course racer. When I am not busy driving my kids places, you can find me experimenting in the kitchen, selling Beautycounter, painting stuff, making kombucha, knitting, growing food, or training for races. I am a passionate dog lover. I love their company on my runs and how quickly time seems to pass when running with a 4-legged friend. I will work up to it through Dog Gone Running! If I start running with DGR Dog Nell, it sounds like I’ll be well on my way to perhaps setting that goal. I am a retired trampoline gymnast who is excited to be part of the DGR Team. Hi, my name is Liz and I couldn't be happier to be a Dog Gone Runner!! I love being outdoors and there's nothing better than running with four-legged friends. I was a dog owner for most of my adult life and was thrilled when I learned about this opportunity to have some furry companions join me on my runs. Dogs are great fun, wonderful companions and have a wonderful sense of adventure. Since joining the Dog Gone Running team, my jogs through new neighbourhoods, parks and along the river have never been more satisfying. I look forward to running with your dog one day soon. Hi! My name is Laura. I started running a few years ago, and have started to get more serious about longer distance running ever since my first marathon in 2018. I grew up on a farm, and have always loved all animals, but especially dogs. I didn't start running with dogs until recently, and it's been a blast! Since my two dogs are seniors, it's a privilege to be able to run other people's dogs. I'm finishing up a MA, and I can't think of a better writing break than spending an hour or two with the happiest running buddies/training partners in town! I grew up in Halifax, though Calgary quickly became home since moving here in 2009. I was into various running sports in my youth, though it wasn't until I slid through an obstacle race at the last minute in 2013 that I've come to embrace running as an interest of mine. I do love dogs, though the frequently irregular hours in my lifestyle would be too unfair for me to have pets of my own. When I learned of Dog Gone Runners, I immediately was excited at the idea of getting involved! Now I'm looking forward to making new friends, four-legged and two! It was Beamish (our 6-year-old Bernese Mountain Dog) who introduced me to — or, should I say, demanded that he get involved with — Dog Gone Running. Beamish was my high drive, gotta go run – not walk, dog and Dog Gone Running was the perfect match to help him have fun and use up some of that extra energy. He started running with some of his ‘favourite people’ in December 2013. I have completed one marathon and a few 1/2’s in the last 6 years, but I wanted to get back into running on a more regular basis. So, I laced up my running shoes and have started back on the trails and paths. ​​​​ I also love pet sitting and am an expert cuddler. My name is Evelyn and I'm stoked to be a part of DGR's wonderfully active team of running guys and gals, and of course, doggos! I've recently gotten back into running after a long on-and-off casual love affair with the sport; with a goal of successfully completing the Spartan Super Race in Kimberley this year. I'm also an avid climber in addition to being a runner and cyclist. I also proudly work as a registered dietitian in my little practice named Eatuitive Nutrition. If you ever run into me on the trails or mountains, please say hi! Hi, my name is Paige, and I love running and absolutely love animals! You could say I basically grew up with a zoo. What I lacked in siblings, my parents made up for in pets! We had it all: dogs, cats, horses, rabbits, lizards, a chinchilla; you name it. It was heaven! Today, the zoo has dwindled to my Shih Tzu named Remington. However at his ripe age of 13, he never ceases to amaze me when it comes to hiking up trails like Sulphur Mountain. When we are gassed after 3 hours, he is raring to go again! As for running, this has been a love of mine for over 10 years. Currently I am training for the Half Marathon in Jasper and figured what better way to train than with a furry friend! I am very excited about being a part of the Dog Gone Running team and look forward to running with your dog some day! Hello! My name is Sarah and I've never owned a dog before, but that's never stopped me from introducing myself to every single one I meet. I'm told I started running as soon as I realized I could, and that's probably contributed to my almost profound connection with dogs, since I was well acquainted with all types of child leashes and harnesses to keep me from bolting into traffic. I went into track and field in middle school and I loved sprinting so much I decided to keep doing it through university with the training group, CALTAF. However, the toughest part was never being able to find a partner to do those long runs with me, which brought me to Dog Gone Running! I'm so excited to meet with the beautiful pets here and combine two of my life long passions, running and dogs! I have always loved athletics and sports having played soccer for 7 years and dipping my toe in a multitude of other sports throughout grade school. More recently, I graduated from Mount Royal University with a bachelor's degree, and am pursuing volunteer opportunities while working for DGR. In August of last year, my partner and I adopted our sweet dog Steven who we must "share" run time with because we are both runners. I am so grateful to be a Dog Gone Runner because it keeps my running consistent and regular, I never have to run alone again with the added bonus of puppy kisses and cuddles! I've had a love for dogs my entire life, consistently begging my parents for a puppy up until summer of 2016 when we got Juno. As someone who loves dogs and is a fairly avid runner, it only made sense for me to start running dogs. It's a pretty perfect way to spend time, being outside, running with an adoring dog who wouldn't rather be anywhere else in the world. This is the best way to get outside, get active and enjoy the company of some furry friends (plus being paid to run is pretty neat too). ​I can honestly say I have loved dogs a lot longer then I have loved running! My sister was training for a 10k and convinced me to run with her…..I hated it! But things changed and 20+ half marathons later, here I am! I love dogs (have cats). So when this opportunity came up, I could not say no! Looking forward to running with my new friends every day! My name is Lucia and I'm originally from Yorkton, SK but moved to Calgary 11 years ago to pursue education and a professional career in the "big city." Growing up, I was never a long distance runner but I was a performer- jazz, ballet, Ukrainian dance; you name it! Fitness and health have always been a priority to me and my family, as well as volunteering and being involved in the community. I also have a love for animals; big and small. I rode horses for many years and had a Tabby cat (Mittens) who lived for 21 years. When I met Ruth a few years ago at her fitness class, she told me about DGR. This was a perfect situation--cute pups and running outside in our beautiful city. Spending time with these 4-legged friend every week brings a special light into my life and I look forward to each run.